Parrots and humans have a few things in common, looks, of course, not being one of the similarities. Let's take a look at some of these characteristics. Parrots are known for their long lives. The parrot you bring into your home may expect to live from twenty to over a hundred years. Parrots are not like goldfish, they don't sit quietly in a corner waiting to be fed. They can be noisome, and often quite disruptive. Because of a parrot's longevity it is likely to see several owners in its lifetime, it having outlived each of the ones who took care of it. Parrots also become displaced because they can wear out their owner's patience. Parrots can be high maintenance creatures, needing a great deal of attention and medical care. An owner of such a bird might find themselves spending a large portion of their income on that little member of their family. This is something rarely considered when that impulsive urge to buy pretty Polly overcame them. Another similarity between the bird of beauty and we humans is the capacity to become insane if not properly attended to. Seeds, time and money are not the only things parrots are likely to rob from their owner. Parrots, especially birds like the Macaw can be very loud and talkative. It's been said that residents a block away will complain about the neighborhood Macaw. As much as a parrot speaks, they say nothing of value. Some parrots are capable of learning a thousand words, and are even able to form sentences beyond what they've been taught. But with all their intelligence, they are unable to form a real thought of their own that is of any value to others. Place a few parrots in a room, and what they will say is what all the other parrots are saying. An original thought is beyond them. Parrots are mimickers, as are we humans. We tend to take on the accent of the one we're speaking to, and to wear clothes like those in our company. Like children, a parrot will pick up the sounds and the words of those in the room, or the TV, which often are not words you want them to repeat, nor the ones you taught them. Parrots repeat what others say. If an untruth is spoken by any of them, it is likely to be repeated by all in the room. The fact that everyone says the same thing causes what might otherwise be seen as untrue, to be considered as truth itself. Common voices create the illusion of truth. This phenomenon can be seen in how the acceptable of our grandparents is now not acceptable, and the unacceptable of their time has become the norm. There's a popular picture of a boy and a dog praying alongside a bed. The dog has all the earmarks of being a real prayer warrior, someone you would expect God would certainly listen to. Of course we know better, but how many of us consider that our words might be of as little value as those of the dog, or our parrot that has learned the words to a few prayers? This is good advise for those who have the mind of Christ. 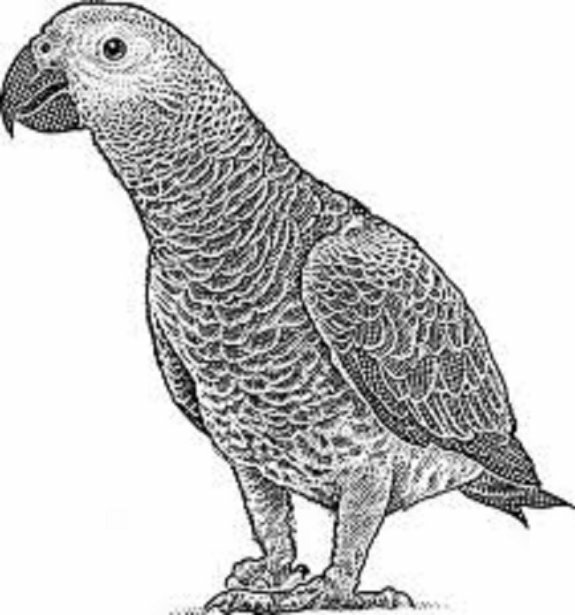 But if our mind is anything like that of our parrot, then our all having the same thoughts and beliefs and words will be of little use to us or anybody else. A vail by design is intended to hide something. It might be a beautiful item in itself such as the vails that hung in the Tabernacle. But the vail's function is to hide what we might most desire to see. Sometimes a vail has the function of preventing chaos or confusion. Consider the vail Moses had to wear in order to prevent the Lord's glory that he reflected from disturbing those in the camp. In the case of a parrot, a vail can be placed over the cage which serves to keep the parrot from talking. I've seen this process in action, both with a macaw, and in the lives of people who chose to speak other words than what is accepted by those in the room. Parrots, unless they've been captured from their native environment, have little to tell about what they've learned, or what they've seen. People in general seem to live simple and ritualistic lives, and for this reason they seek superficial excitement that is often found in the movie theater, or in computer games. Parrots live in a cage so small that two of them are not likely to be able to turn around comfortably. This is true of many people as well, they feeling comfortable existing shoulder-to-shoulder with those in their society. Parrots, though they may say the same words we humans do, are not able to speak for themselves.. Parrots have no vocal chords with which to form their words. They mold their words through their mouth instead of their throat. Also, parrots, along with being restricted in their movement, being in a cage, are highly prone to demanding attention by way of their ability to quote words they have little to no understanding of, and were given to them by someone who probably knew nothing of what they were teaching them. Jesus here is referring to how the leaders of the Jews were inclined to take a simple statement or law given to them through the written Word and turn it into a multitude of regulations that a person is unable to keep (Acts 15:10). Today, what were called Pharisees in days of old, are now (or should I say are still) called Rabbis, and they are still in the process of writing more and complicated additions to the laws of God written so long ago. Parrots in this same vein will spout out all the laws and regulations they have been taught, but have no intention of, nor the ability to keep any of the laws they quote. To many of the people Jesus was dealing with, it wasn't what a person was that is important, but what a person appeared to be that they were interested in. Parrots are known for their beautiful coats of feathers, but with all that beauty, they serve no other purpose but to draw attention to themselves. We hear the expression, or at least the expression used to be popular, “Holy cow!” But have you ever heard a person exclaim “Holy parrot”? Parrots are more likely to be associated with a pirate than they are a saint of God. The purpose of mankind is to become like their Creator. This same purpose is lacking with those of the aviary species. Whereas a parrot will only speak the words a man has taught them, we humans are to speak the words God has given us. However, like Adam and Eve with the serpent, we tend to go our own way and do as do the parrots, speak what we hear from other humans (or snakes), and do as they tell us God wants us to do or not do. When we humans are locked into a situation where we're with like creatures, it's difficult-to-impossible to speak our own words. Unlike the parrot that can say anything it wants to, we humans are forced into speaking only those words that fit the beliefs of others of our acquaintances. To speak anything contrary to what is acceptable can very likely cause us to be considered outcast, and therefore shunned by those we wish to be in the company of. A parrot is likely to be particular what they swallow, realizing by nature that everything that appears edible is not so. Consider wax fruit as an example. We humans are not as discriminating as our feathered friends. An example of this very thing can be seen by the example of Jim Jones of the Jonestown massacre, the people of Wacco Texas, and a strange phenomena that was occurring at that same period of time. There was a child who was given the name Marjoe, after Mary and Joseph of New Testament fame. Marjoe, like a parrot, enjoyed imitating the famous preachers of his day. At about the age of seven or so his father advertised him as the youngest ordained preacher. People were taken in by this juvenile saint, and would flood his family with their hard-earned money. Others with a similar devious bent began to “ordain” their babies and the like, and their reward was forthcoming: that being fame and fortune. A parrot is not likely to fall for such a deception, but we humans, it seems, love to be deceived. And this from the very beginning in the garden. We don't read of a parrot being deceived by a snake in the grass, only humans. This is one injunction we humans are very likely to follow. We are prone to turning our thinking over to others who are, like the parrot, able to speak many words and say nothing of real value. While we are given the ability to think and to reason, something not afforded a parrot, we are not given the inclination nor the desire to use this unique ability. However, unlike the parrot, we will have to stand at the end of time and give an account as to how we used our God-given abilities and gifts.